One of the best compliments a photographer can get are clients who sought you out because they have previous experience with being in front of your camera. That would be the case with Carl + Sarah! Carl was a groomsmen in a previous client's wedding, Molly + Caleb, and now it's his turn! This couple is such a joy to be around...even though the forecast was looking pretty dreary, and it even sprinkled DURING their session, these two didn't let it phase them! We enjoyed strolling through downtown Charleston smiling and laughing along the way! The plus side to rain? 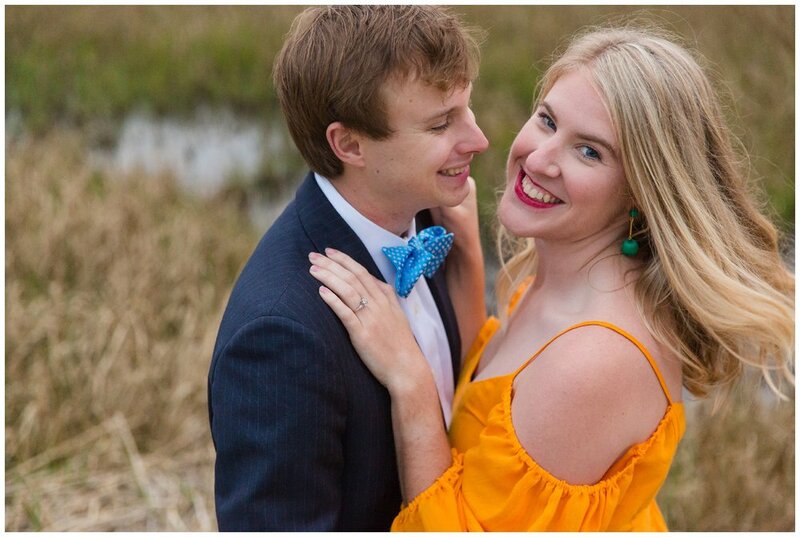 The greens popped AND the skies were beautifully overcast :) We ended our session together on the Charleston Harbor with Sarah + Carl dancing to a little Michael Bublé. I can't wait for their TWO day wedding event in October with Bouquets + Bowties!